Johannes Willms, older brother of Princess Marie-Gabrielle's husband Antonius, recently got married to Sofia Elisa Grivet Brancot in the gardens of Castello di Pralormo in Italy. Naturally, Princess Marie-Gabrielle, niece of Grand Duke Henri, her husband Antonius Willms and their baby son Zeno were among the guests. Last week's edition of German magazine Bunte has a lengthy report about the wedding if you happen to want to grab one. Also in wedding news... Duchess Sophie of Württemberg and Maximilien d'Andigné celebrated their civil wedding last Saturday, September 15, at Schloss Altshausen in southern Germany. 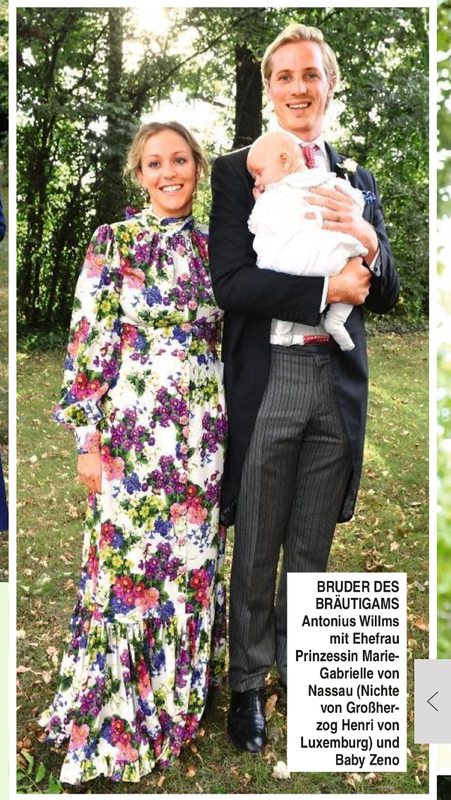 The bride is the niece of Hereditary Princess Sophie - and presumably named for her - so it is no surprise that the Hereditary Princess and Hereditary Prince Alois were among the guests for the nuptials. The religious wedding will take place at Schloss Tegernsee in Bavaria on October 20. We can surely expect a bigger Liechtenstein turnout for the big bash. A few visuals though none of Sophie and Alois can be found at Bunte.